This project originally started out as the Evergreen challenge but then morphed into much more than that! Very simple and quick to create, and a great hostess gift as well. You can use regular candles, or the LED wax version. Place the image in desired position and gently heat with a heat gun. Smooth the tissue paper down into the melted wax and smooth edges of wax with fingers. The tissue paper becomes translucent in the melted wax. The snowman and angel candles are both the LED versions. The snowmen were stamped in StazOn Jet Black and colored with Fabrico markers. The images were die cut with a layer of cardstock underneath to cut the tissue more cleanly. The images may be reversed when applying to the candle as the color is equally vibrant on both sides. The angels are stamped in StazOn Royal Purple and Azure. 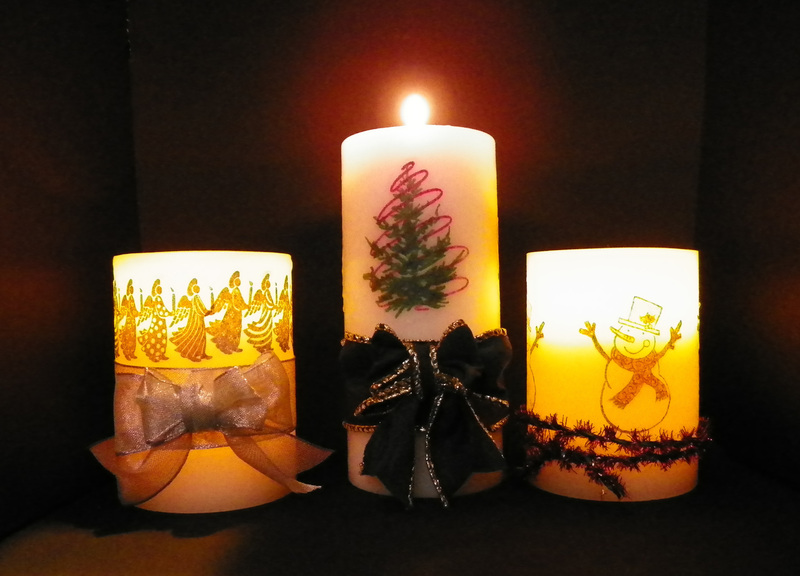 All three candles are finished with decorative trim or ribbons with bows. What Could Be Better than Donuts and Coffee? Chocolate donuts are simply the best, even better if they have Cocoa flavored frosting as well! 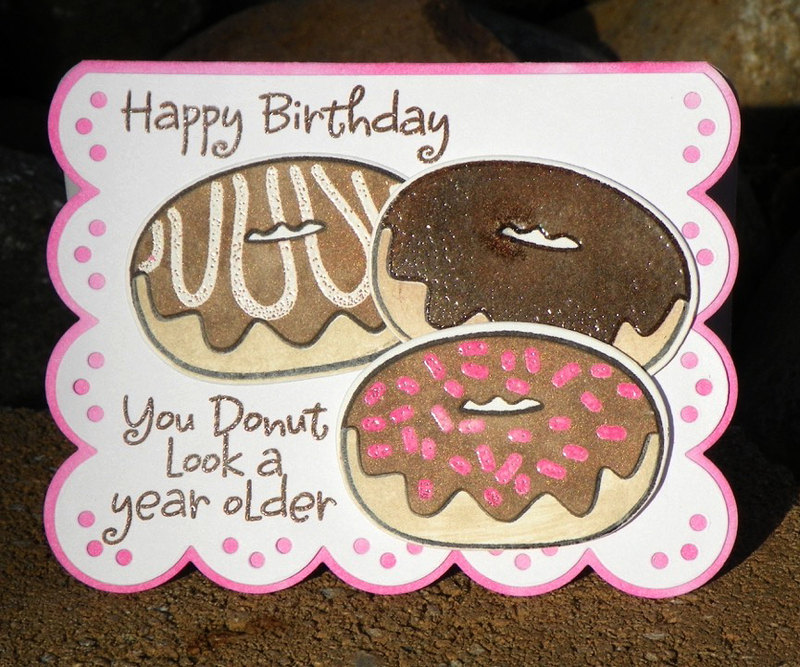 I used a new set of The Stamps of Life to create a few yummy looking donuts with different types of frosting. Delicata Dark Brown Shimmer is embossed to create a shiny frosting on one donut. The other donuts are stamped and embossed to create Radiant Neon Electric Pink sprinkles, and white frosting from white embossing powder. 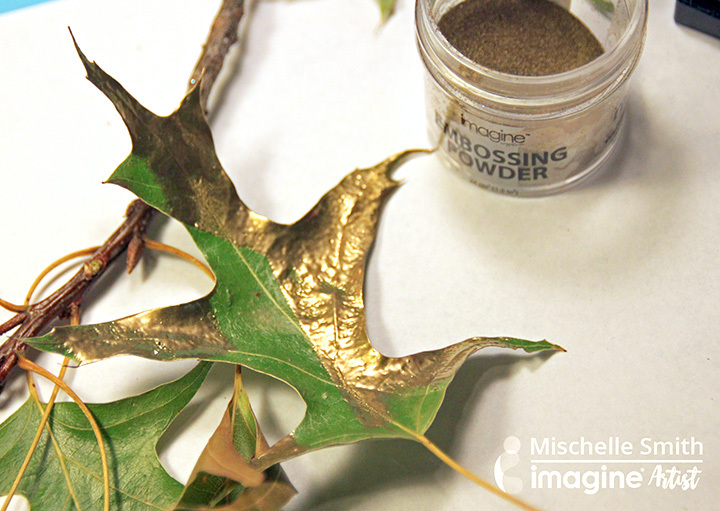 Delicata Dark Brown Shimmer is applied with an ink blusher to give a shimmery frosting look. Tenia here from Jazzy Paper Designs with a very cool card using Cocoa as my main color and of course made with Imagine and Tsukineko products. I stamped my sentiment and images onto kraft paper with Brilliance Pearlescent Chocolate and embossed everything with clear embossing powder. I fussy cut the images to create some fun layers. For the background I added some splatter onto kraft paper using Fireworks Craft Spray in Rich Cocoa. To create my finished look I adhered a scrap piece of patterned paper, and added washi and sticker stitches onto the image panel. I used foam tape on some elements to give the nice depth, and added a few fun matching embellishments. 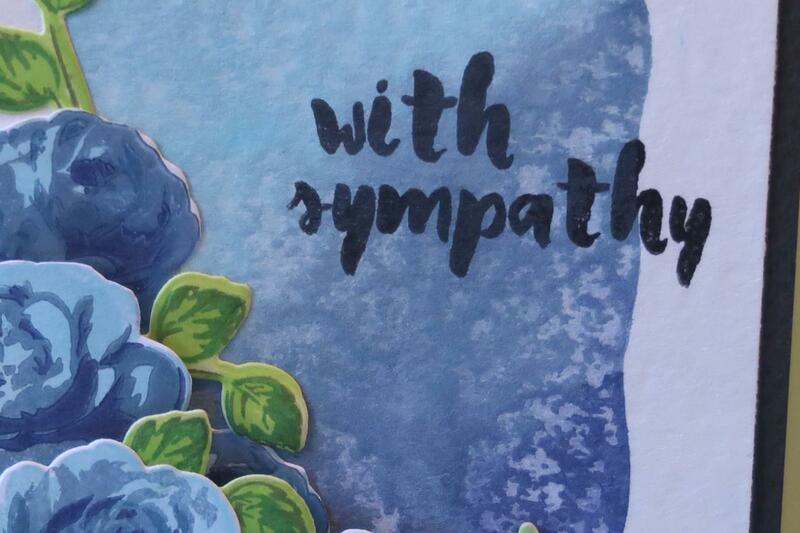 Sympathy cards are a gift given to comfort the bereaved, in this instance, it is for a family member who now lives overseas. I wanted to create something soft and beautiful to deliver a message of condolences and love. The textured background is created with Amplify! and the shimmer of Brilliance Graphite Black sets of the Radiant Neon Electric Pink. I started by applying the Radiant Neon Electric Pink Amplify around card base. I added drops of Amplify in white and smaller drops of Amplify in black. I used a rubber brayer to move the Amplify around on the card base, and used a heat gun until the texture puffed up. I used the scraps to die cut mini hearts with Lawn Fawn’s Stitched Journaling Card set. 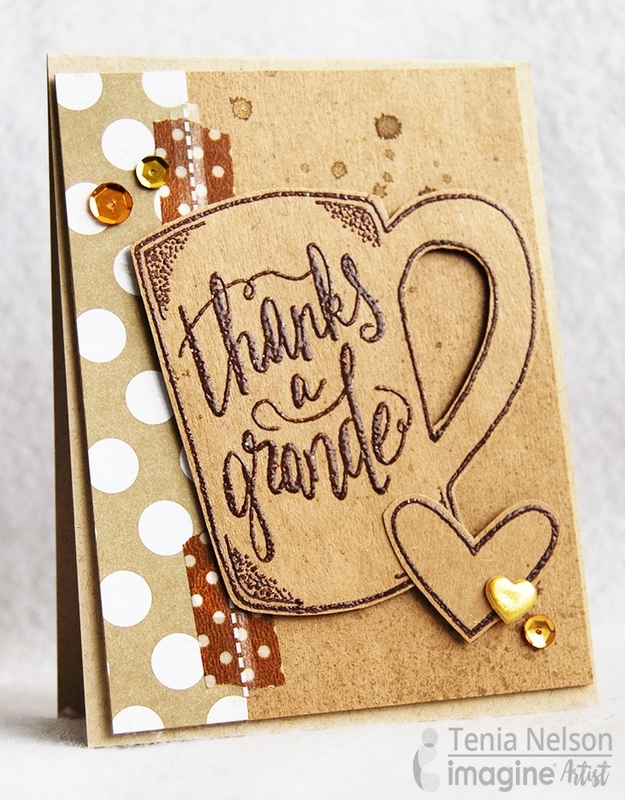 I applied Brilliance Graphite Black ink with an InkBlusher to my die cut Decorative Elements. I die cut the center from the Amplify! 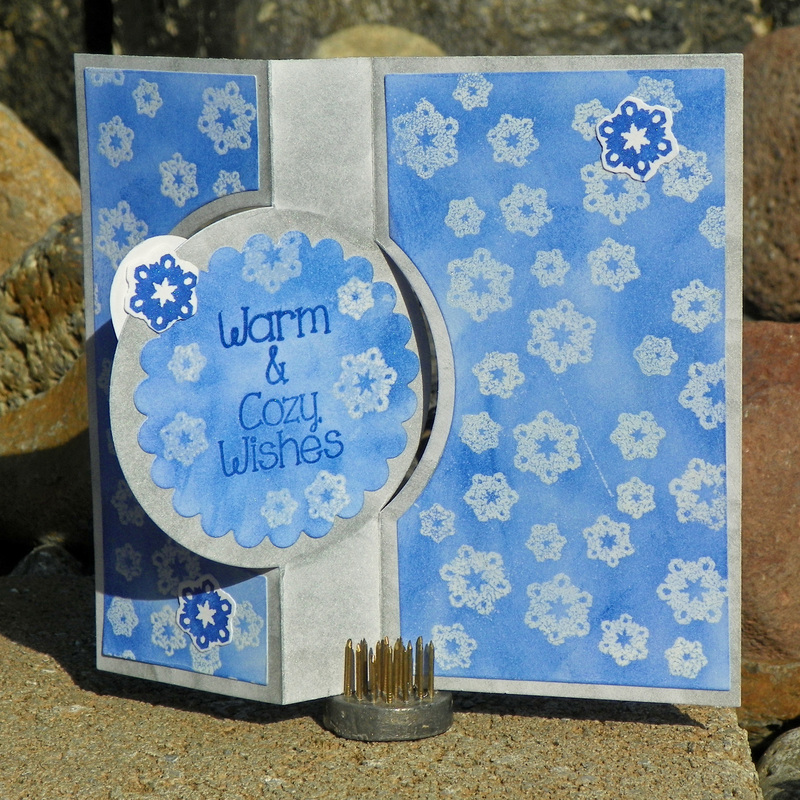 textured card base to use between the inner and outer decorative pieces. I stamped the sentiment in Radiant Neon Electric Pink to match the Amplify medium. I had forgotten to clean the stamp before this step so the “mistake” became a creative choice instead and matched the distressed card base! I also gently inked the sentiment with Brilliance Graphite Black to add a bit more black low-lights to the image. I finished the card with the DeNami Design white ribbon around the Decorative Element outer frame, and added the mini hearts. You could add other embellishments as desired. And you are finished and ready to add your own personal message! It’s not a fun part of life but with beginnings comes endings. It’s always hard to create a card when that time comes so why not make a bit of beauty to help us all through those rough moments. I created this card with those tough times in mind. I also wanted to share a technique I discovered when I was making this card that can be used to create an amazing background for not only this card but so many. 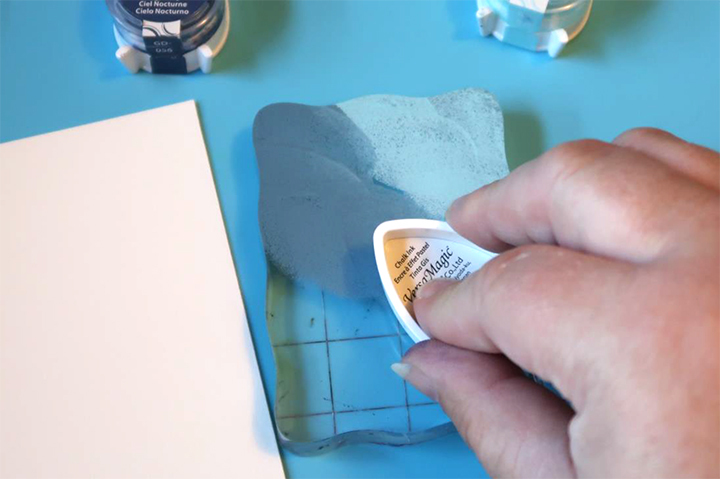 Trim a piece of watercolor paper to the desired size. Choose 2-3 colors of VersaMagic Ink you would like to use for the background. Apply the inks to a stamping block in any pattern you desire. Mist the ink with a bit of water. Place the inked block on the watercolor paper and let it set. As the block sits on the paper you will notice how the paper begins to absorb the water moving the ink around creating a lovely pattern and texture. When you can’t take the wait any longer, remove the stamp block to reveal the design created by the ink, water, and paper interaction. Once the ink has dried you will be left with a beautiful matte design perfect for any project. Here you can see just how lovely that design is. I did try this technique on regular cardstock and compared the two side by side. The regular cardstock didn’t create the depth and design of the watercolor paper. While it is pretty and very usable, it just doesn’t yield the same effects. 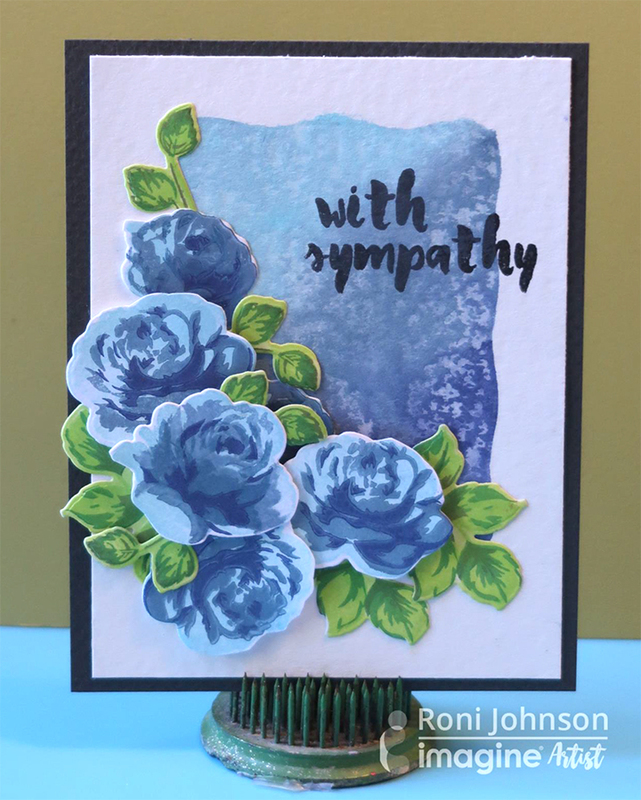 The remainder of the card was finished by stamping the layered flowers with the same VersaMagic blue inks; leaves were stamped using a combination of VersaColor and Memento Dye inks and all images were then die-cut. The sentiment was stamped over the VersaMagic background using VersaFine Onyx Black ink and the stamped die-cuts were then affixed to the card. Time for a few candy treats, Halloween candy that is! This sweet little-handled box was easy to create with dies and stamps and is ready to give to a special someone! The box was die cut then stamped to create a balanced use of the images. One side of the box is die cut to create an opening for a window that is finished with a bit of recycled packaging. The die cut itself is used to make a matching tag. To outline the sentiment in coordinating colors the image was stamped several times just out of alignment to create the shadow effect. Add a few bakers twine to tie the tag to the box and a few mini candy bars finish off the little gift. Halloween is quickly approaching and this year I’m lucky enough to have 3 little ones to spoil this year. I thought it would be fun to make a Tombstone Treat Box to hold their “loot”. To create the initial layer of color on the tombstone background start by pouncing Niagra Mist, Aloe Vera and Sahara Sand VersaMagic inks on the Craft Mat. Mist the inks with water and pounce the cardstock into the ink mixture until you are satisfied with the color. Let the cardstock dry completely. Since VersaMagic is such a dense ink this step will not take long. Next, pounce Green and Purple Encore’ ink onto the craft mat, mist with water and dip the cardstock in the ink one or more times. Once again, let the cardstock dry. Crumble the paper to create the spooky wrinkle texture. Sponge London Fog Memento Dye ink over the creases in the paper with a Jumbo Dauber to highlight the wrinkles and give it a distressed, worn look. Print the tombstone treat box pattern and use as a guide to cut out the treat box. You can also ink directly onto the template but I choose not to because I did not want the cut lines and folds to show. Assemble the tombstone using Tear It Tape. Ink the edges of the tombstone with Black Memento Dye Ink. Add desired stamped images and sentiments. And the best part, fill with lots of chocolates and candies then… Enjoy!